Matthew, acknowledging his sinfulness, repaid fourfold anyone he had cheated, and he distributed his remaining possessions to the poor, and he followed after Christ with the other apostles. St Matthew was attentive to the instructions of the Divine Teacher, he beheld His innumerable miracles, he went together with the Twelve Apostles preaching to “the lost sheep of the house of Israel” (Mt. 10:6). He was a witness to the suffering, death, and Resurrection of the Savior, and of His glorious Ascension into Heaven. Having received the grace of the Holy Spirit, which descended upon the Apostles on the day of Pentecost, St Matthew preached in Palestine for several years. At the request of the Jewish converts at Jerusalem, the holy Apostle Matthew wrote his Gospel describing the earthly life of the Savior, before leaving to preach the Gospel in faraway lands. In the order of the books of the New Testament, the Gospel of Matthew comes first. Palestine is said to be the place where the Gospel was written. 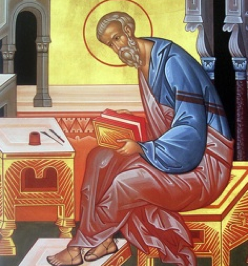 St Matthew wrote in Aramaic, and then it was translated into Greek. The Aramaic text has not survived, but many of the linguistic and cultural-historical peculiarities of the Greek translation give indications of it. They put St Matthew head downwards, piled up brushwood and ignited it. When the fire flared up, everyone then saw that the fire did not harm St Matthew. Then Fulvian gave orders to add more wood to the fire, and frenzied with boldness, he commanded to set up twelve idols around the fire. But the flames melted the idols and flared up toward Fulvian. 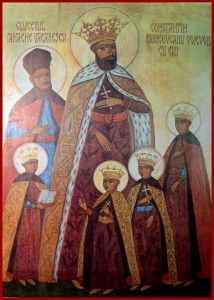 The frightened Ethiopian turned to the saint with an entreaty for mercy, and by the prayer of the martyr the flame went out. The body of the holy apostle remained unharmed, and he departed to the Lord. The ruler Fulvian deeply repented of his deed, but still he had doubts. By his command, they put the body of St Matthew into an iron coffin and threw it into the sea. 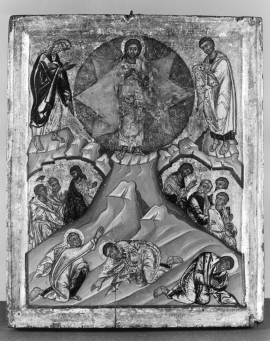 In doing this Fulvian said that if the God of Matthew would preserve the body of the apostle in the water as He preserved him in the fire, then this would be proper reason to worship this One True God.